An unhealthy employee causes more loss in revenue due to sick days. The estimated cost to employers of absence and performance loss from physical health issues alone is $225.8 billion per year, and each year it continues to increase. Organizations are looking at the bigger picture and realizing how simple changes can develop a more successful business. 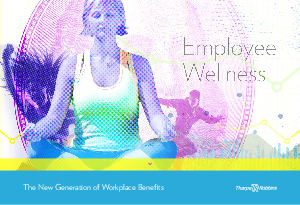 Wellness programs undeniably benefit both the organization and its employees. Numerous studies have found a direct link: A healthy employee makes for a happy employee, in turn increasing productivity within the organization. Employers cannot control what employees will eat or how much they will participate in an exercise program; however, employers can take simple measures to encourage healthier habits — from providing better vending machine options and tobacco-free work environments to conducting wellness courses to promote healthy lifestyles. Although these options cost companies money in the short term, wellness programs and incentives are an excellent investment, and a way to potentially save money in the future. Although a strategic and comprehensive wellness program involves an upfront investment, most companies view this as a long-term, cost-saving strategy. There are several studies that validate the return on investment (ROI) that companies enjoy when implementing a strategic wellness plan. A Harvard University analysis of 32 peer-reviewed studies in 2010 found that medical costs fell by about $3.27 for every $1 spent on wellness programs. In addition, absenteeism costs fell by about $2.73 per $1 spent. In a recent study by the Principal Financial Group, employees enrolled in workplace wellness programs reported a reduction in personal healthcare costs, most commonly because of the fitness center discounts and free preventative screenings. The survey results show that employers who invest in wellness programs see increased employee retention, attendance, and productivity. The 2012 Employer Health Benefits Survey by Kaiser Family Foundations found that 63 percent of firms providing health benefits offer at least one type of wellness program. Thirty-seven percent of these firms cited that the primary reason wellness programs were part of their heath plan was to improve health and absenteeism in the workplace. TharpeRobbins has the expertise to develop?and manage an outcome-based solution that?can take your wellness initiatives to the next level. By using the TharpeRobbins enterprise technology platform, our clients can see their return on investment (ROI) as they track, measure, and report on productivity, reduced absenteeism, and increased employee retention. We are a passionate and dedicated organization where our only job is creating recognition and incentive programs that are tailored to your?unique needs. Our approach focuses on designing the best solution that will provide long-term benefits to your organization and your employees. That’s what sets us apart from all the others. Ready to get started? Visit us at TharpeRobbins.com to learn how.